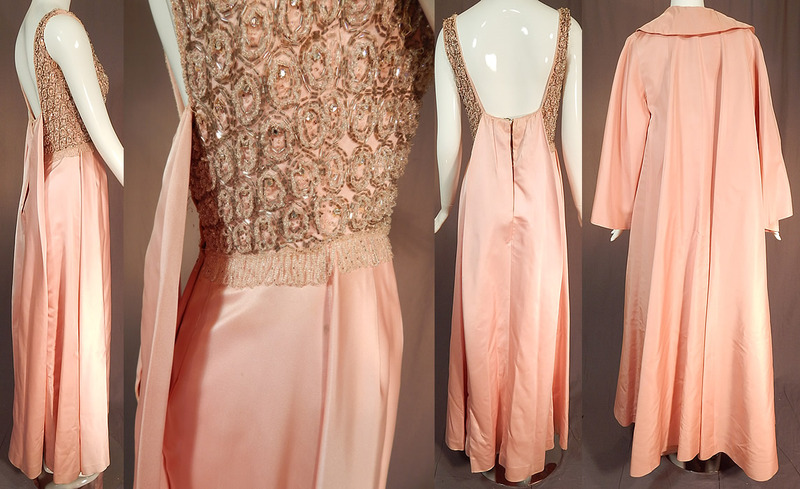 This vintage Victoria Royal Hong Kong pink silk crystal beaded evening gown and coat dates from the 1960s. It is made of a pale pink pastel color silk satin and taffeta fabrics with silver and crystal beading on the top done in circular designs with rhinestone centers and a fringe trim bottom. This pretty pink evening ensemble includes a long floor length gown with pleated full skirt, watteau back train drape, a fitted sleeveless bodice with squared neckline, backless, fully lined and has a back zipper closure. The dress measures 57 inches long, with a 34 inch bust and 26 inch waist. 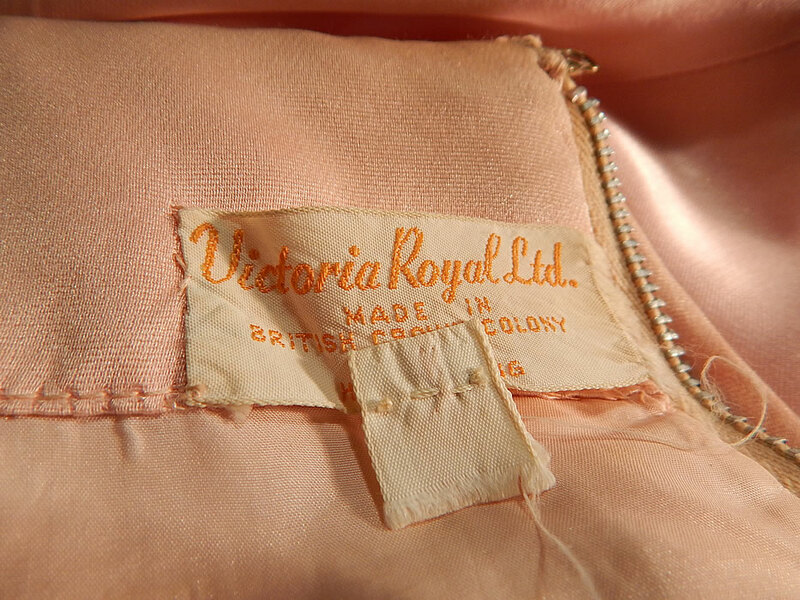 There is a "Victoria Royal Ltd. Made in British Crown Colony Hong Kong" label sewn inside. 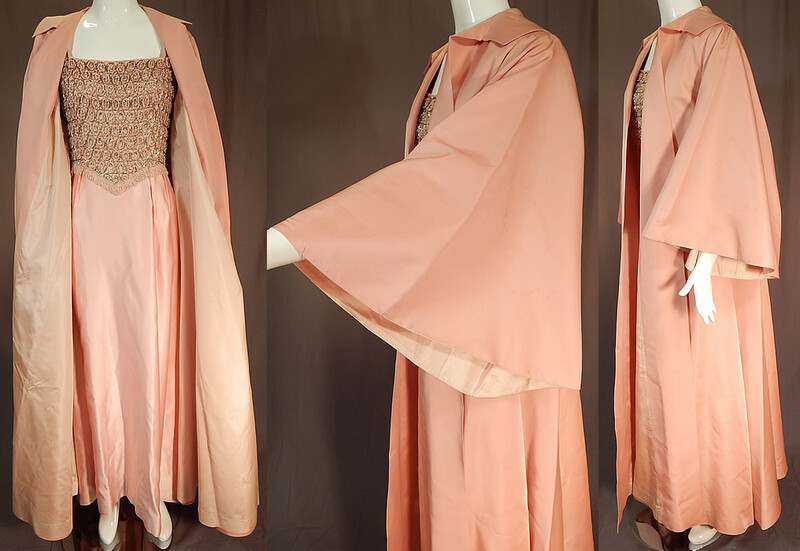 Included is a matching pink silk taffeta long floor length full coat, with wide flared bell shape sleeves, a fold over collar, open front with no closure and is fully lined. The coat measures 56 inches long, with a 40 inch bust. 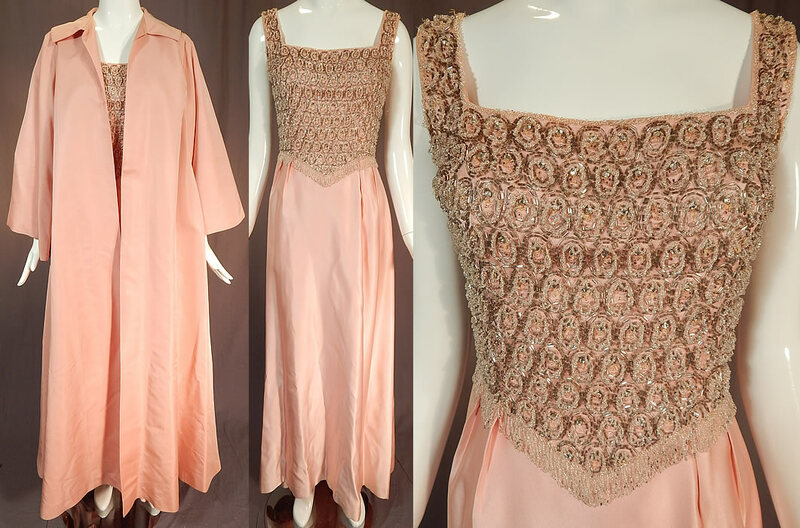 This custom made evening ensemble is from the estate of Karen Wessler who performed on the Tennessee Ernie Ford Show as one of "The Top Twenty", Ernie's back-up group. 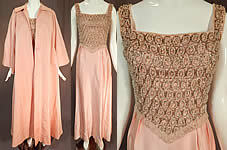 It is in good condition, with some small faint stains on the coat sleeves and a few loose missing beads on the dress top. This is truly an exceptional piece of custom made wearable art!